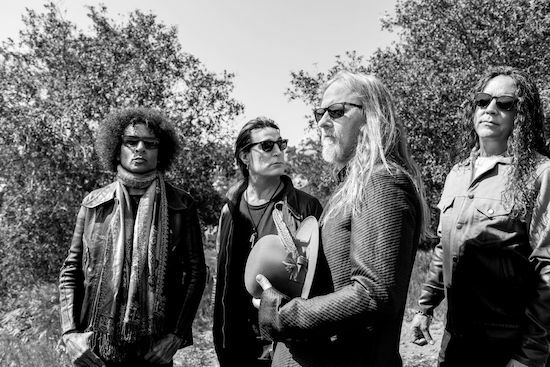 Alice In Chains have released the third episode of Black Antenna, a dark sci-fi thriller set against the backdrop of the band’s Grammy-nominated album, Rainier Fog (BMG). Watch it below. Black Antenna was directed by Adam Mason, written by Paul Sloan and Adam Mason and produced by Elizabeth Mason and Nick Vallelonga, who recently won two Oscars (“Best Original Screenplay”) and (“Best Picture”) for Green Book. Black Antenna tells the story of Alpha (played by Green Book actor Paul Sloan) and his 21 year old daughter, Beta (Viktoriya Dov), who drive their beat-up truck across California in silence, speaking only telepathically. Together they rob and steal from the men the girl seduces, taking cellphones, laptops, whatever they can find. Alpha is trying to build something – an antenna – desperately trying to find a way to get a message to their people back home. Meanwhile there are unspeakably dark forces who have discovered their existence, and are now hell-bent on tracking them down and eradicating them before more of their kind can come and join them. Special make up effects are by Autonomous FX (Blade Runner 2049, Bright, Mindhunter, Maze Runner). Jason Collins is an executive producer along with Alice In Chains.